A Community Helper theme teaches students about all the people who live and work in their neighborhood. 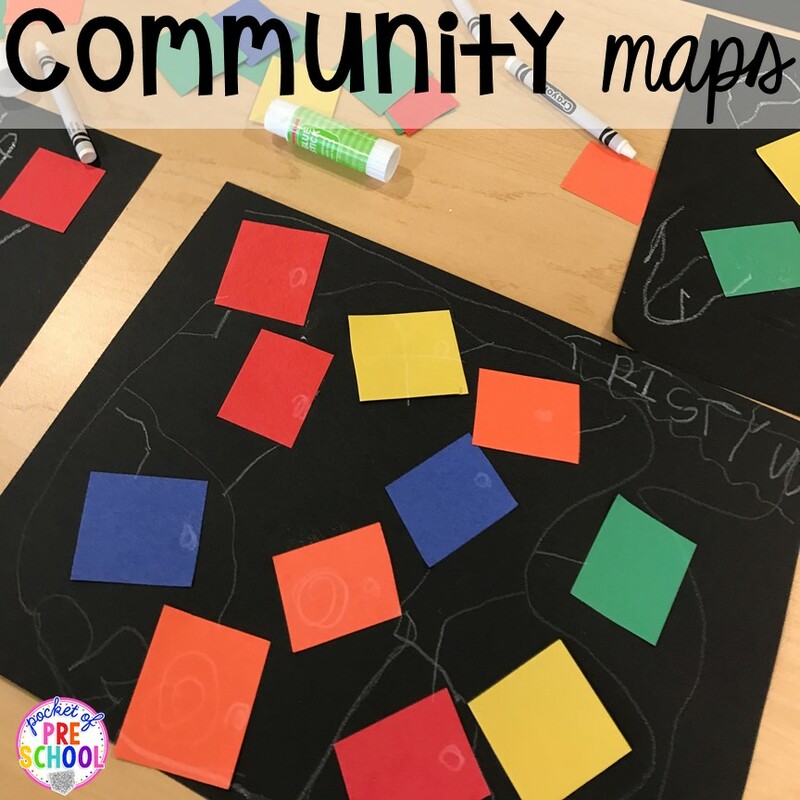 There are so many fun community helper themed activities you can do with preschool, pre-k, and kindergarten kiddos. You can sneak in tons of learning experiences too! These are my go-to, favorite community helper themed activities I do with my kiddos. Don’t forget to grab the FREEBIES later in this post! To start the theme, we did this community helper puzzle! Students have to match the tools and/or vehicle to each community helper. We filled the bookshelf with tons of fiction and non-fiction community helper books. Check out my favorites in the Community Helper Booklist post. The kiddos went crazy for our community helper word cards in the writing center. They were talking, writing and drawing all about different community helpers. It also sparked conversations about what they wanted to be when they grew up! I like to give students an opportunity to build their own communities. On the wall, I posted some STEM I Can Build Posters to give students a visual of what various community buildings looked like. I also put out wooden vehicles, community signs and sign books. Grab the FREE Community Sign Here! To make the signs, just print, laminate and tape to a block. I used Jenga blocks. I taped road tape to the floor too! 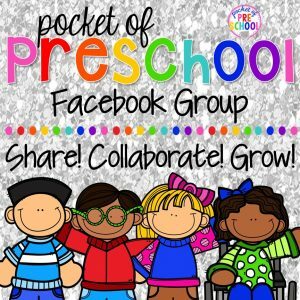 Check out the community my preschoolers created! For small group, students created community maps with paper squares (to represent buildings) and a white crayon (to represent roads). My kiddos LOVE number mats so I created these Community Helper Number Mats with community vehicles. Students count the number of vehicles, trace the number and build the ten frame with play dough (or you can use counters). I used play dough to sneak in some extra fine motor work. Students LOVE envelopes, making mail and getting mail! This Mail Measure definitely sparked their interest! Students measured how long each item was, then sorted it by size just like real postal workers do! I added in a few real envelopes for students to measure and sort as well. Learning how to write all the letters is HARD so make it fun with these fire sensory writing bags! Just squirt some red, orange, and yellow paint in a baggie and tape it shut. Then students pick a fire letter and write it on the baggie with their finger or a q tip. You can also build and write names or sight words with the fire letters then write it on the fire baggie! Another way to sneak in fine motor work is with finger painting! Learn about firefighters and create fire finger paintings with red, yellow and orange paint. Grab the FREE Fire Printable HERE! One of my students’ favorite community helpers are construction workers so I wanted to create an activity using construction worker tools. I wrote letters (you can do numbers or shapes too) on thick cardboard and students hammered golf tees (aka nails) on the letters. They LOVED this activity and played it over and over again during center time! We read a book about chefs and made letter soup as a follow-up activity! Students rolled a color dice and picked a matching veggie counter or magnet letter! Simple, but a ton of fun! Students were talking all about letter names and sounds too! Anytime I can have an opportunity to teach kiddos about being healthy, I do! I did a few activities about dentists and the tools to keep our teeth healthy. To play Dirty Tooth, students rolled a die and counted out the coordinating number of food (aka pom poms). When the tooth was dirty, they brushed it clean with a real toothbrush. Some of my pre-k kiddos rolled two dice, added the dots and counted out the total. Dentists, doctors and veterinarians all use x-rays so I though an x-ray play dough tray was perfect for our community helper theme! I put out people (aka gingerbread) cookie cutter, hand cookie cutter, dog cookie cutter and block play dough. I also put out white pipe cleaners (aka bones)! Student LOVED exercising those little muscles to create their play dough x-rays! Little learners can collect data and report their findings in super simple ways like this Vet Graph! Students counted and covered each item and represented the total on the graph using bingo chips. Once all the data was collected and counters are placed on the graph, students can compare the quantities (more, less, equal too). I think every student in my class is fascinated by garbage and recycling trucks! They are so big and smash all the trash. For the sensory table, I put in paper pet bedding (the garbage) from Walmart, garbage trucks, recycling trucks, tweezers, trash and recycling bins, and tissue squares. Students used the tweezers to collect the trash and smashed it into the bins! Teach students all about the impact trash can have on the environment, and how to recycle at the science table. Make pollution sensory bottles, sort different types of recycling and try to clean up litter. Grab my All about Recycling and Trash science unit HERE from my TPT store for all the printables, activities, read aloud, journal pages, parent notes and more. To build on the recycling theme, students made a cutting collage with newspapers. I cut the newspaper into strips and placed dot markers on the table. Students cut the newspaper strips up and glued them to the paper. Lastly, they dotted their collage with the dot markers. There are so many options for the dramatic play center when you do a Community Helper theme. Try a Fire Station! It’s a ton of fun and kiddos can learn all about how to be safe in an emergency! Read all about my Fire Station and my favorite tricks to make some DIY firefighter props. 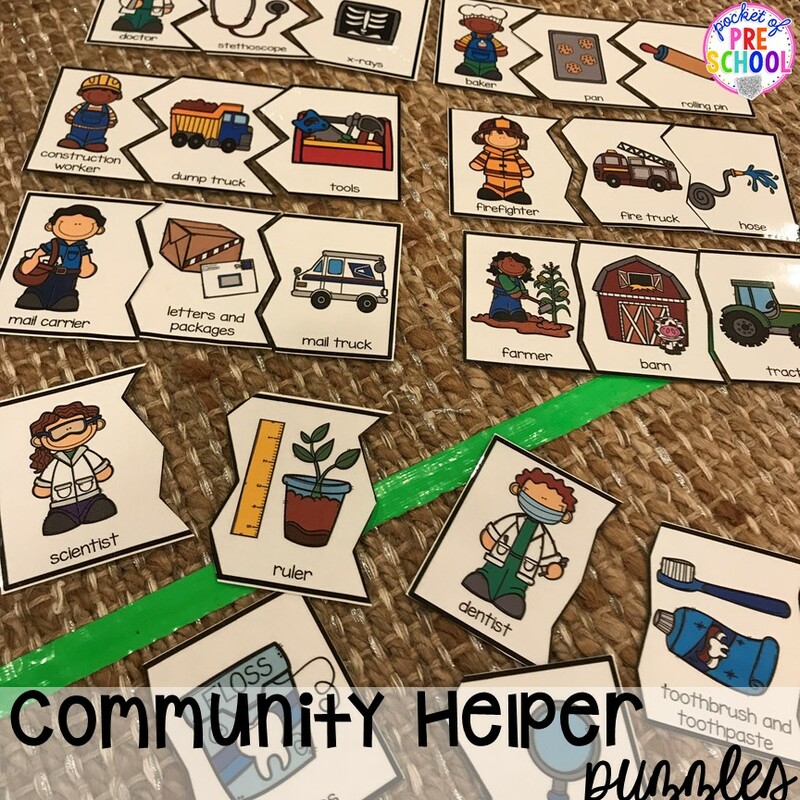 Do you want ALL the Community Helper printables (plus a ton more)? Grab my Community Helper Math and Literacy Centers pack HERE from my TPT store. 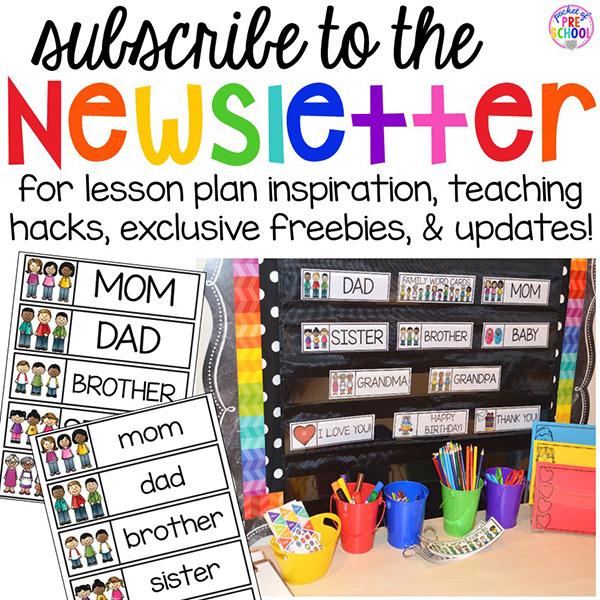 I created all the activities for you so all you have to do is print and prep! Love these community helper activities? Pin this image!